I am not a huge fast food person. Even as a kid I have very few fast food places that I actually would eat at. My husband and I still rarely go out to a fast food place to eat. Chick Fil-A is one of those places that we actually go to. We always get the same thing every time we go. I always get their chicken nuggets with their Chick Fil-A sauce and he always gets their chicken sandwich on wheat (yes you can get a wheat bun) with fries and their Chick Fil-A sauce. The first time I tried the sauce I was quite skeptical. It is a mix between a barbecue sauce and a honey mustard sauce. I actually really don't like mustard, but I decided to try it anyways and boy am I glad I did. I haven't gotten another sauce from them since! Well in all my foodie ways of course I have been dying to try and figure out how to make it. Well the other night I did and I think we got pretty close! Whisk all ingredients together. 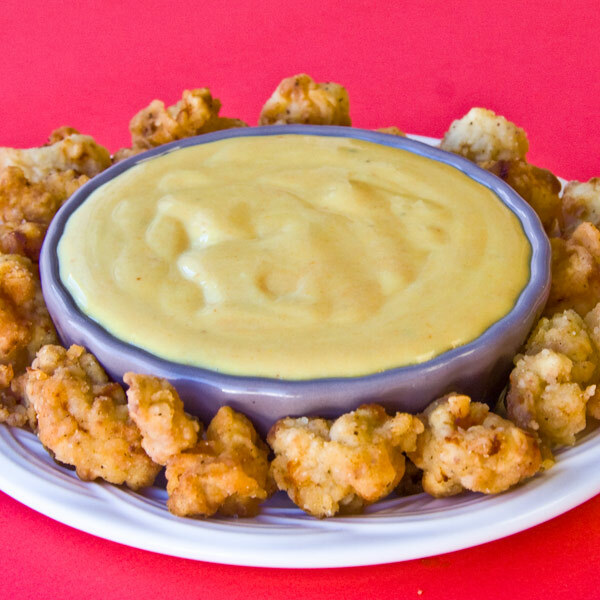 Serve as a sauce for chicken nuggets, fries, chicken sandwiches, hamburgers, or anything else you might want it on. I also think it could be quite yummy as a salad dressing, but I will have to try that one out later. Chickfila sauce is great in devil lef eggs and chicken salad. Especially iv you use their spicy chicken. Thanks for the recipe. Hi I worked at Chick-fil-a as a teenager at the store that developed that sauce the first time. we just mixed bbq, mustard and coleslaw sauce. Thats it. We used the sauces that already came to the store in bulk. we mixed it one day and saw that it tasted awesome. Their bbq sauce is really sweet thats probably why you added the honey. but instead of mayo, look for a coleslaw sauce and you might see that it tastes even better. What are the proportions of each and what brand of cole slaw dressing was used? I made 2 batches. One w/ the mayo and the other w/ the coleslaw dressing. The coleslaw dressing won. Tasted just like the original. So yummy :) 10 extra lbs here I come! What is coleslaw sauce and where can you find it? Marzetti's is probably the best. It can be found in the refrigerated dressing section of most grocery stores. I tried this and I did not like it. I even tried again with the suggestion from the person that worked at Chick Fil-A at one time and that didn't taste good either. I guess I'll just have to keep going and ask for extra sauce! !